n/a Latin. Minerva was the Roman goddess of crafts, wisdom, and war. Antiramon + Win Ratio 80%! Yatagaramon + Win Ratio 80%! 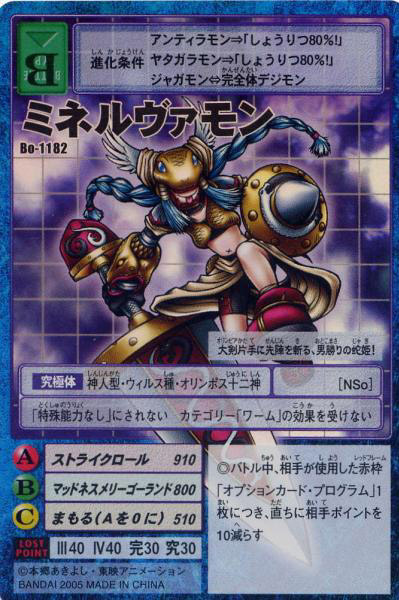 Jagamon + Any Perfect Digimon "This strong-willed snake princess beheads the vanguard with her one-handed blade, Olympia!" She cannot lose her special powers. Category "Worm" has no effect. During the battle, if your opponent uses a Red Frame Option Card Program, your opponent loses ten points.